Hoards of ancient Greek coins have been found in Spain, so the history of coins and coinage in Spain goes back more than two millennia. During Roman times many mints were active in Spain, and with its Mediterranean coast, Spain has played an active part in the development of Europe and the western world. Spain has been occupied wholly or partially be Phoenicians, Carthaginian, Greeks, Celts, Romans, Vandals, Visigoths, Moors and French. In 1492 Ferdinand and Isabella removed the last of the Moors . During the sixteenth century, Spain was the most powerful state in Europe, and therefore the world. It was responsible for opening up much of the new world. Spain's political power weakened with the defeat of the Spanish Armada in 1588, and Spain was ruled by France from 1808 to 1814. Spain became a republic in 1873 to 1874, and again in 1931. During the twentieth century Spain was wracked by civil war. The forces of General Franco were victorious, and a greater Spain emerged as a strong modern nation, and is currently an important member of the European Union. 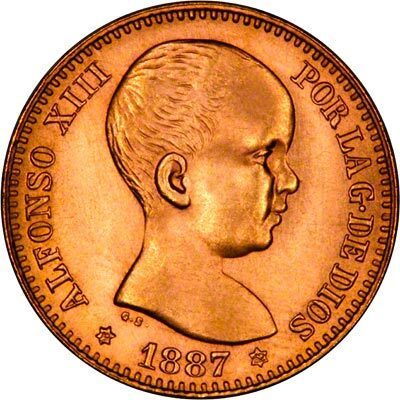 Alphonso XIII was one of the youngest monarchs ever to be portrayed on a coin. He was born on 17th May 1885, and his father Alphonso XII died on 25th November of the same year, so the young Alphonso was just six months and one week old when he became king. 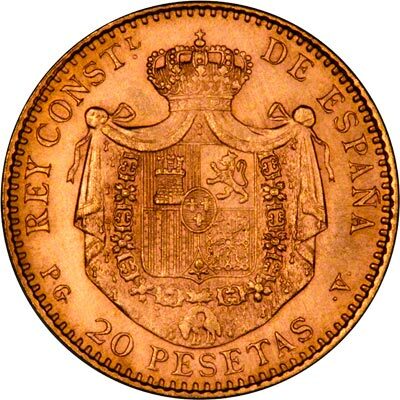 Gold twenty peseta coins were struck in 1889 and 1890. 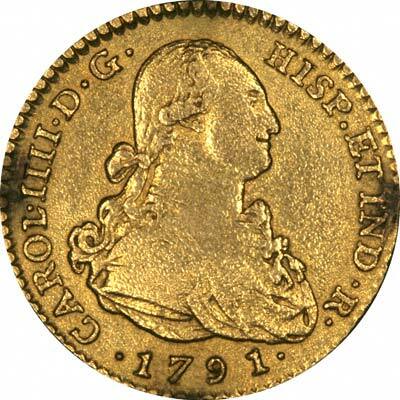 The coins dated 1887 were issued as official restrikes in 1961 and 1962. 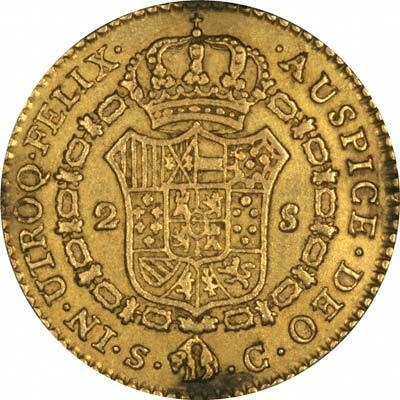 As with many Spanish coins, the actual year of issue is often placed on the small stars near the date. 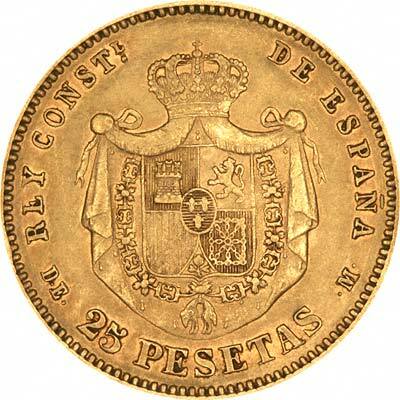 We often have Spanish gold coins for sale. The table below show specifications for Spanish gold coins, followed by coins for sale from our stock. 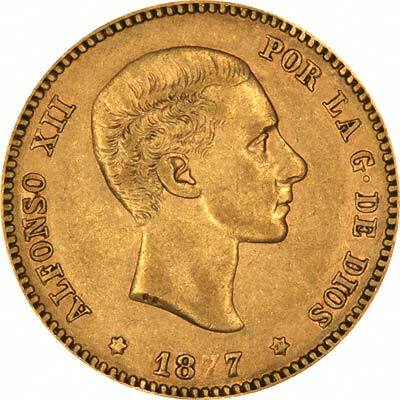 For Spanish coins in silver or base metal, or Spanish coin sets other than gold, please look at the Spanish Coins page of our original website.